A past officer of the Advanced Aero Vehicle Group, president of the Muslim Student Association and subsystem lead for the Satellite Team, Takroori encourages students to enjoy every part of their day during their college life. “Try to participate in student activities, research projects, and join clubs and design teams,” he says. 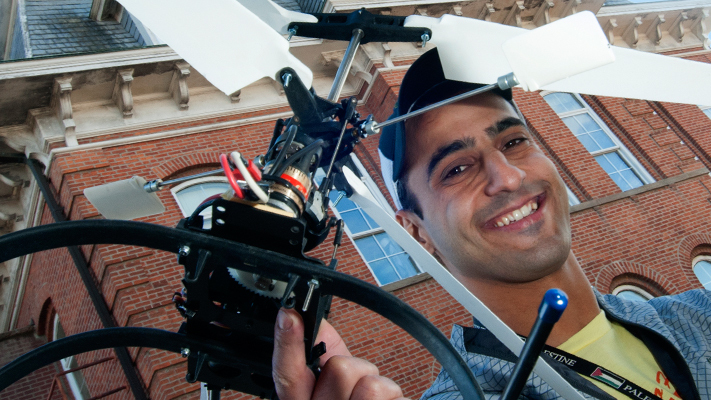 Takroori, now a graduate student in mechanical engineering, earned a bachelor’s degree in aerospace engineering in 2012. During the summer, you’ll find him working as a counselor in a number of S&T camps including Aerospace Camp and Robotics Camp. As a junior, Takroori began studying thermal stratification in HVAC systems. The research was part of an Opportunities for Undergraduate Research Experiences project, which earned him first and second place during his junior and senior years, respectively. Now, using wind tunnel tests, Takroori is examining how flow baffles affect the mixing effectiveness of two air streams with different temperatures. During his free time, Takroori volunteers for Habitat for Humanity and participates in community projects, including helping coach the Rolla Lady Knights Soccer Team alongside his aerospace engineering professor, Hank Pernicka. “But my favorite is usually spending time with my niece and nephews in St. Louis,” he says. “I usually visit my brother, Firas, and his wife, Rana, who are the reason for my success. And I spend hours with their little kids building and shooting model rockets in the park while teaching them about rocket science,” Takroori says. His new goal? To be a part of the manned mission to Mars, either as an engineer designing the spacecraft or by actually traveling during the mission. Anan is a credit to S&T and an inspiration to all engineering students, pursuing his academic aspirations along with philanthropic and extracurricular activities with diligence and perseverance. May he realize all his dreams, short- and long-term. Anan was instrumental in the success of Jackling/Summer Engineering Camps the last two years. His enthusiasm, wit, and personality were a delight to observe. He represents S&T well and is an outstanding young man. He certainly will be missed! Anan, has worked as a mentor for our student success program over the past 3 years. He is a passionate young man and the students love him. He is a tremendous asset to Missouri S&T. Keep up the good work Mr. Awesome!! Anan is a smart student. I worked with him in many projects. He is a leader and inspiring guy. Anan volunteered for Habitat For Humanity for years. He is an amazing inspiration for this generation and a great example of success. He always put others’ needs ahead of his own and still managed to get great degrees from an amazing university. Thank you S&T for taking care of such a great person. People like him will lead the world to a better future one day. We wish you the best of luck “Mr. Awesome”. Don’t forget about us when you graduate and move on. I believe Anan will be a part of the manned mission to Mars! His determination is unfaltering! My son has taken part in the programs which Anan helped organize through the Satellite Team and I have had the pleasure of working with him at DCE. He is and ever will be our “Mr. Awesome” and we wish him all the best. Intelligence, compassion, enthusiasm, adaptability, responsibility, and of course, charisma….these are just a few of the characteristics Anan posesses and shares freely, as he gives back to both the university and the community. In any role Anan engages, he is truly a rock star! Thanks so much for being a part of the events I was fortunate enough to work with you together in Anan, and may your future take you to Mars and beyond! This is amazing. Only yesterday you left Bethlehem and now Missouri S&T made you an awesome rocket scientist. Everyone is proud of you Mr. Awesome. I know this man personally and he is really a smart guy and he always has a goal to seek. i wish him the best of the best. I shared this with my son, so he could be inspired. May you have much sucess in following your dreams. Joyce, I also showed this to my daughter who is obsessed with outer space. She asked ” Maybe I can go with Anan to Mars?”. I will share this with my high school students. I am sure many of them will be interested in attending some of S&T’s summer camps and meet that Mr. Awesome guy. The international students at Missouri S&T truly work hard for their success and they seem to care so much about the well being of others. I am sure many kids in the States and over seas will also be inspired by this. YAAY! I know this guy. He was my summer camp counsler and he showed us how to build and shoot rockets. It was super cool. Can’t wait to become a rocket scientest too. Best of luck mr awesome. Anan is an inspiration to everyone who has met him. I know that no matter what path he follows, he will continue to inspire everyone he meets.